I'm one of those grandmas who displays lots and lots of photos of my loved ones. All around my house. For this post, I began counting the number of pictures I have placed here and there. And stopped thirty six. With the remainder of the main level plus the family room to go, I've chosen to just guesstimate here. I'm guessing there are fifty or so scattered about. On walls, bookcases, mantels, and more. I delight in seeing my sweeties, old and young, in pictures. But with that many pictures to adore—and dust—I clearly don't need anymore. My eight-year-old step-grandson loves to draw. And color. And craft. And create. So when I received a Magic Sketch from Boogie Board free for review, Bud was the perfect product reviewer for this post. What's a Magic Sketch? It's pretty much the coolest thing ever, Bud deduced after a few minutes with it. Technically, though, the Magic Sketch is a kid-proof, waterproof, innovative art pad that provides a new and exciting screen on which kids can draw, learn, and play. Then erase with the push of a button and repeat. Again and again. As I’ve mentioned here many times, one of my favorite sources for tasty home-style recipes is Taste of Home. I recently had the pleasure of trying out for free yet another super Taste of Home cookbook, this one called Taste of Home Recipes Across America. It's 735 of the best recipes from coast to coast. The hardcover Taste of Home Recipes Across America (512 pages and published by Reader’s Digest) highlights regional recipes from across the country. Divided into five regions (Northeast, South, Midwest, Southwest, and West), it's the best of the best specialties enjoyed by locals, plus ethnic specialties passed down through generations that became hometown favorites — all shared by real family cooks, not fancy-schmancy celebrity chefs. Being a Colorado resident, I was interested to peruse the culinary favorites featured in the Southwest category. Most turned out to be the flavors I know, love, and make. What I found most surprising about Recipes Across America, though, was how much the recipes of the Midwest — where I was born (in Minnesota) — felt like home. Several were foods I hadn’t thought about in years, but am now determined to cook up at my home here in the Rockies. Recipes Across America isn’t just a cookbook, it’s a journey across the country in ways that relate to food. In sidebars throught the book you'll find food facts, folklore, recipe histories plus photos of food festivals and landmarks. 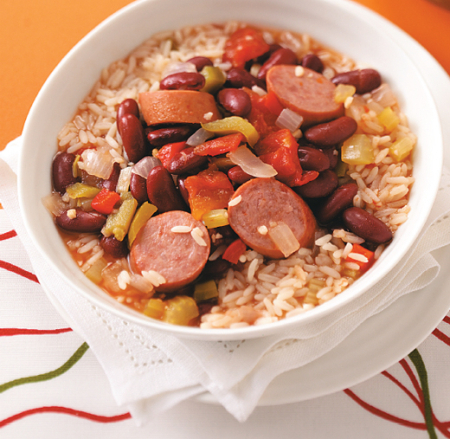 Smoked turkey sausage and red pepper flakes punch up the flavor of this saucy, slow-cooked version of the New Orleans classic. For extra heat, add red pepper sauce at the table. 1. In a 4-qt. slow cooker, combine the first 11 ingredients. Cover and cook on low for 8-10 hours or until vegetables are tender. Stir before serving. Discard bay leaf. 2. Sprinkle each serving with onions. Serve with rice. From now until September, Recipes Across America ($24.99) is available for purchase only at http://www.recipesacrossamerica.com. Come September 12, it will be available where books are sold. 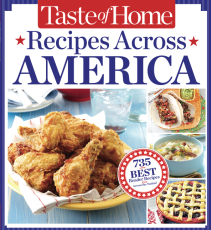 Taste of Home has generously offered to award one winner a copy of Recipes Across America ($24.99 value). Enter to win via Rafflecopter below through midnight August 12; US residents only, please. Winners will be notified via email and have 48 hours to provide shipping information; prize to be shipped by brand representative. Disclosure: I received a free review copy of the book plus the offer of one for this giveaway. Anecdotes and opinions are my own. As a parent, I always appreciate humorous and heartwarming stories from other parents on their journey along the same road I've taken. Chicken Soup for the Soul books are known for such tales, and they don't disappoint with their latest, Parenthood: 101 Heartwarming and Humorous Stories about the Joys of Raising Children of All Ages. As I'm now a grandma and all done with raising little kids (though I do so enjoy my little grandkids), I appreciated that this edition included not only stories on parents of young children, but stories about older kids, tales of moms and dads facing the empty-nest phase, too. 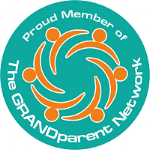 The back cover of the book says, "Older parents will laugh a lot, tear up a little, and nod their heads in agreement as they recognize shared experiences shaping young lives." I did all of that and more. "Swing with me." The neglected swing set calls me. Gritty, squeaky, and booby-trapped — the girls don't play here anymore, and the spiders know it. They've claimed the play set's tree house as their own no-girls-allowed zone, planting their flag of gossamer threads across the threshold." Childhood is indeed a short season. That season can be hard on parents at times. Parenthood: 101 Heartwarming and Humorous Stories about the Joys of Raising Children of All Ages helps us all feel a little less alone in the journey. Parenthood: 101 Heartwarming and Humorous Stories about the Joys of Raising Children of All Ages, published March 2013, has a suggested price of $14.95 and can be found nearly any place books are sold, in hardcover and electronic versions. The publishers of the Chicken Soup for the Soul series have graciously offered to give two random winners a copy of Parenthood: 101 Heartwarming and Humorous Stories about the Joys of Raising Children of All Ages. Giveaway entries accepted via Rafflecopter (below), through midnight MDT May 14. The two winners will be drawn May 15 and contacted by email for shipping information. Disclosure: I received a free copy of the book for review, as well as the offer of two copies for giveaway, to be shipped by the brand. Regardless of one's spiritual beliefs, political leanings or age, it's hard to deny the impressive influence and appeal of Billy Graham, world-renowned author, preacher and evangelist. Presidents past and present have requested his prayers and presence during times of crisis. Celebrities as well as the not-so-celebrated find comfort in his humble message and unpretentious manner. At a time when cultural heroes, athletes, politicians — even Elmo — continually let us down, Billy Graham continues to lift us up and serves as a true American icon. The publishers of the Chicken Soup for the Soul series appreciate the unprecedented impact Billy Graham has had on people of all faiths, races, genders, age and politics. For the first time in the brand's twenty-year history, it has published a Chicken Soup for the Soul book focusing on one individual — Billy Graham. Billy Graham & Me: 101 Inspiring Personal Stories from Presidents, Pastors, Performers, and Other People Who Know Him Well, edited by Steve Posner and Amy Newmark, celebrates and honors the calm yet courageous man known as "God's Ambassador." The sheer diversity of the contributors attests to the wide appeal of the man who regularly preaches to others to not be judgmental and to model love. As Steve Posner mentions in the book's introduction, "The personal stories in this book show us why so many individuals from differing faiths, nationalities, and political beliefs regard Billy Graham as a touchstone of goodness." Posner points out that although there have been numerous books and articles written on Billy Graham since he was first catapulted to fame in 1949, the stories in this collection "give us an inside glimpse of the ways in which the everyday Billy Graham has lived as a loving father, brother, grandfather, uncle, mentor, pastor, statesman, and friend." Contributors to Billy Graham & Me include Tony Blair, Dan Rather, Barack Obama, Wynonna Judd, Ricky Skaggs, Philip Yancy, George H. W. Bush, George W. Bush, Jimmy Carter, Roseanne Cash and many, many more (101 total, in fact). Plus, there are more than 40 historic photos of Billy Graham with family and friends — including Ronald Reagan, Charlie Daniels, Pope John Paul II and hip-hop artist tobyMac — and an evocative afterward by Billy Graham. What I loved about the book: Billy Graham seems to have always been a part of our culture as long as I remember, yet I was never incredibly familiar with his extensive work and influence across the globe, in large ways and small. I was touched by the deeply personal accounts and recollections of Graham shared by the public figures who have had the privilege of meeting him, working with him, or just plain counting on his message to give them strength during tough times. Plus, the photo section made me think of my father. Not in the figurative sense, the father with a capital F, but my father, my dad, whom I've always thought looked strikingly similar to Billy Graham, especially in both their younger years. Even more so, one of my uncles — who, interestingly enough, was once a pastor — looks even more like Billy Graham, back in the day as well as now. Mostly, though, I loved the way the stories moved me and made it clear there really are American heroes who surely won't fall from their pedestals. At a time when I've been questioning many so-called heroes of our culture, the words about and from Billy Graham came through for me in unexpected ways. Billy Graham & Me: 101 Inspiring Personal Stories from Presidents, Pastors, Performers, and Other People Who Know Him Well, published February 2013, has a suggested price of $24.95 (hardcover) and can be found nearly any place books are sold, in hardcover and electronic versions. The publishers of the Chicken Soup for the Soul series have graciously offered to give two random winners a hardcover copy of Billy Graham & Me: 101 Inspiring Personal Stories from Presidents, Pastors, Performers, and Other People Who Know Him Well. Giveaway entries accepted via Rafflecopter (below), through midnight MST April 3. The two winners will be drawn April 4 and contacted by email for shipping information. What's more fun than a bouncy house? Not much, especially when it's a bouncy house for kids, a bouncy house you can set up indoors or out, a bouncy house from One Step Ahead. One Step Ahead, a super spot for grandparents and parents to purchase the coolest of cool kid toys and more, sent me one of their popular Bounce-A-Round inflatable jumpers to review plus an offer to give one away to my readers. So I blew it up using the included double-action hand pump (it took me 15 minutes, which was far better than I expected) and placed it in my living room, ready to be reviewed. I could blather on in text about how the review went, but as pictures are worth far more than my meager words, I'll share with you the photos of how that review went. First up was Milo, a few months under the recommended age of 2 but nonetheless ready to jump with joy, with Mom nearby. The Bounce-A-Round is far larger than I and the moms of the reviewers expected. The One Step Ahead site gives the dimensions as 46"L x 48"W for the inflated jumping area, with walls, inflated, of 32" - 38"H (on top of the height of the inflated base). The base inflated is 66"L x 77"W. With all that space, the reviewers' moms willingly climbed in to pose for a picture with their little ones (no jumping by moms, I promise). As with most playthings, it's always more fun when there's a partner in play, and Milo and Caden thoroughly enjoyed sharing the ample space. What's up with the darker photos above? After a bit of bouncing as intended, we decided to throw a sheet over the top of the Bounce-A-Round and make a fort out of it. It was in that version that the boys had the most fun, and I can imagine the hours of play my fort-loving grandsons will get out of it next time they visit. When playtime is over, there's even a bit o' fun involved in deflating the Bounce-A-Round. 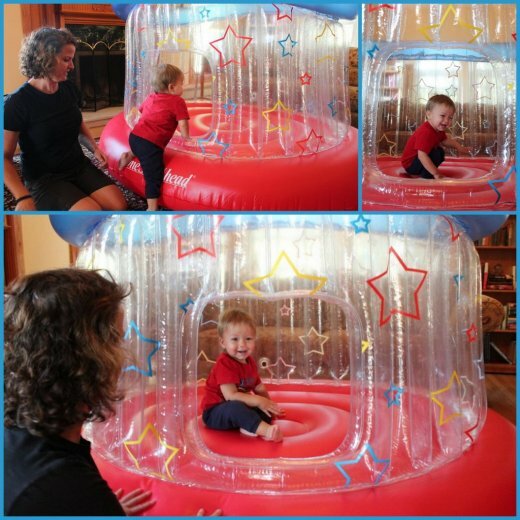 What we loved most about the One Step Ahead Bounce-A-Round: First up is the size. As I mentioned above, the moms and I were quite impressed by how large it is. Also, I was happy the three chambers (base, walls, top rail) inflated so quickly, even without a motorized pump. And I liked the idea the jumper could be used inside or outside, as not everyone has a huge spot for—nor always wants—a massive inflatable toy in the house. (Of course, you'd want to place something underneath when using outside, to protect from pokes that pop, and a pillow at the entrance would be a necessity.) Overall, the entire thing was pretty heavy duty, but I'm glad patches were included just in case the jumper springs a leak somewhere down the road. Suggestions for improvement, courtesy the reviewers' moms: Having a flap over the entrance would be helpful, they both suggested, as kids bouncing near the entrance—especially smaller ones—tumble easily out the door. Plus, they thought an included cover for fort-like play might be nice, as the sheet I threw over the top kept coming off. The One Step Ahead Bounce-A-Round, previously $99.95 but now $79.95 on the One Step Ahead website, comes with a 100% lifetime guarantee, the very same guarantee given every item sold by One Step Ahead. Disclosure: I received the product above free for review, as well as the offer of one for a giveaway. Anecdotes and opinions are my own.